Tod has grown up a PathFinder, one of an ancient seafaring tribe. Her mother, who died when Tod was young, had a very different history. She was from a mysterious magykal desert-dwelling family. When Tod’s father disappears she is not only alone, but soon finds herself swept into the path of an evil sorcerer. Now Tod must choose which of her pasts will help her to survive: PathFinder or Magician. Magyk will allow her to fight like with like, but her PathFinder heritage gives Tod something special – the edge. Angie Sage’s new book combines breathtaking action with fabulous plotting. The characters are instantly engaging, the tension is relentless and Angie’s superlative storytelling weaves the threads seamlessly together for an utterly satisfying read. TodHunter Moon #1: PathFinder COVER REVEAL – soon! 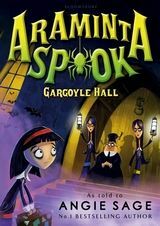 When Araminta throws cold water over her best friend’s mum to disperse a crowd of panicked bats, it’s decided Araminta has been ‘helpful’ one too many times, and she is packed off to boarding school. On arrival, Araminta is surprised to discover that Gargoyle Hall makes her home, Spook House, seems positively cosy. Strange moans and clanks echo down the corridors and the two head girls are equally creepy. Most of the other pupils have been scared away, but Araminta senses that something – or someone – is behind the menace. With the help of best friend Wanda and Uncle Drac’s prize bat, she is going to do something about it!